I figured since it was mentioned quite a bit yesterday I'd do a post on my favorite China Glaze and compare it to OPI Pink Me I'm Good. It's difficult when you're asked what is your favorite polish of all time. I don't think I could answer that, but I know China Glaze Strawberry Fields is up there. I do know it is my favorite China Glaze hands down. have 2 extra bottles of this that's how much I love it. I've never hit bottom on the first bottle I own, but it's half gone! Move over Ruby Pumps! I think Strawberry has you beat! This polish came from the 2009 Summer Days collection. Strawberry Fields is amazing. THE END. Just playing! Strawberry Fields is a medium strawberry pink creme packed with gold glass fleck shimmer. It's the perfect pink. I think this is a pink that will satisfy all. I've heard many non-pink people fall in love with this pink. It has so much dimension with the golden glass fleck shimmer. It's a gorgeous color that would go with anything. These are not dupes, or even that similar to each other. Strawberry Fields is medium pink creme based polish with gold glass fleck shimmer, while Pink Me I'm Good is lighter jelly based polish with golden iridescent glitter. That all being said, it is evident to me why I love both these colors and why many people think of Strawberry Fields when they see Pink Me I'm Good. They're both strawberry pinks and have golden type finishes. I think April of Concrete and Nail Polish who commented on my post yesterday said it best. It is like Strawberry Fields on steroids. Pink Me I'm Good is like Strawberry Fields' Las Vegas showgirl cousin. I honestly like Strawberry Fields better than Pink me good! That has never happend! lol. Its so much more PINK! I must wear SF soon! You have put a fire up my bum about it!!! Wow - that shows you how faulty my mind's eye can be. They're quite a bit different. Thanks for the comparison! I think i like the OPI better! Thanks for showing the difference! Heard amazing things but don't own this girl yet. Heard NOX Twilight in Citrus is a bit similar, just a lighter pink. Thanks for this! I love them both and I am one of those girls who rarely wears pink or red polish! 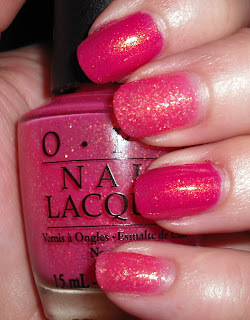 Strawberry Fields is one of my fave pinks. It was a must have for me when that collection dropped. I think I like this one more than OPI's Pink Me I'm Good. It is prettier. Even though I do not have either one. But if I had to choose I'd pick strawberry. Separately, I would have said they are dupes. Now I can't get 'Strawberry Fields Forever' out of my head! Great post. I find it interesting how both can be pinks and both have some type of gold fleck in them and yet have them look so different. It just goes to show why us nail polish crazies love the lacquer....its often quite different even when we think it sounds the same. I love them both. It's hard to choose between the two. CG Strawberry fields is one of my absolute favorite polishes! I love the shade of pink and the shimmer. I totally understand how you could not choose between the two colors as they are both gorgeous.